the PHANTASM ARCHIVES! : 40th Anniversary Sphere Blu-Ray Set Announced! Alright, United Kingdom. You guys have scored not one, but two fantastic sphere set releases on home video. The first came from Anchor Bay Entertainment and the second from Arrow Video. Now it's time for someone else to get some sphere love. Bloody-Disgusting has the scoop on today's big 40th Anniversary news that there is a new Blu-ray Collection set for release this October in the United States... and we're finally getting a sphere replica stateside! Thank you, Well Go USA! This release will pack a ton of extras both old and new, plus a recent 4k restoration of Phantasm II. 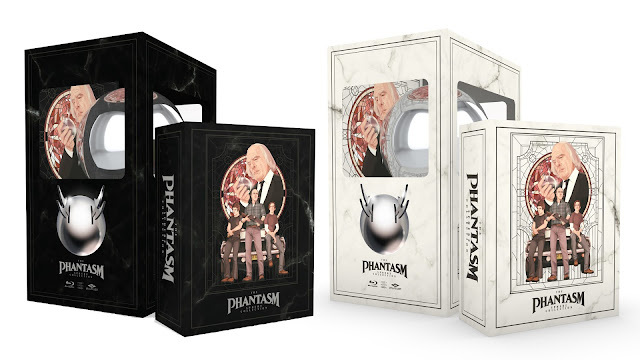 BD also reports that we'll be getting a new documentary on the making of Phantasm Ravager. Very cool!